While immigrants were fasting on the Mall near the U.S. Capitol last month to pressure for immigration reform, the Mexican Congress was allowing privatization of the country's public oil corporation, PEMEX. Separated by 2,500 miles, these events might seem a world apart. NEW YORK (AP) — A federal judge on Monday questioned whether the government was trying to hide or obscure something by failing to give information to a civil rights group about thousands of immigrant detainees held for long periods. U.S. District Judge Richard Berman's written decision came days after government attorneys insisted they needed more time to comply with his September order granting the American Civil Liberties Union's Freedom of Information Act request. ELIZABETH, N.J. -- Eight demonstrators tied themselves to one another wrist-to-wrist in the falling snow Tuesday morning, and lay down across the road in a human chain, blocking access to an immigration detention center in Elizabeth, N.J. Detention officers on their way to work waited in a line of cars stretching down the street. For nearly a minute, the steady blast of a car horn drowned out the sound of the protesters’ chants. By the time the police arrested the protesters about a half-hour later, snow had begun to pile up on their bodies, hiding the slogans on the T-shirts they had pulled on over their sweaters. 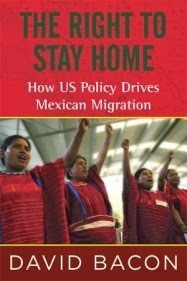 The Right to Stay Home: How US Policy Drives Mexican Migration by David Bacon is a well written, well informed book that explains political and economic currents shaping the US immigration experience. This week we listened to a commentary on our immigration struggle over the last year – and the commentators thoughts on what lay ahead of us in 2014. The commentary was made by one of the great union leaders of our time, a friend of ours and someone we greatly respect. Yet he just seemed to miss the most important point. He cited the great showing we had made in the last elections which indeed set the basis for a turnaround in the Republican party. That was certainly the truth. Then he pointed to the great way we had mobilized in 2013 to try to get the Republican leadership to pass a legalization bill in the House. Well, not exactly. A positive point was the increase in civil disobedience, mostly by young people. It was good to see “the dreamers” not just fighting for themselves but fighting for their parents and the families as well.